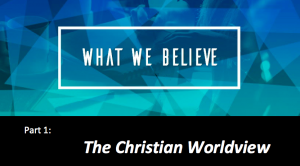 This week we start a series called What We Believe. We will consider basic truths of the Christians faith and then ask the deeper question, “Why do we believe this?” This is an important question in a world will so many different views. We begin with and introduction that looks at the idea of a worldview.